Black Diamond Ranch is a private 1,320 acre gated residential community set atop of rolling hills and old limestone quarries. It has charming streets twisting from the front entrance throughout the entire community. It’s homes and home sites are nestled into the wooded landscape to take full advantage of Black Diamond's breathtaking views of World Class fairways, Tranquil Water Scenes, and Fascinating Wildlife. Black Diamond Ranch was the vision of Stan Olsen, who founded the Citrus County-based golf club community in 1987. Olsen set out on creating one of the premier golf communities in the world, hiring Tom Fazio to fashion 45 holes of spectacular golf. 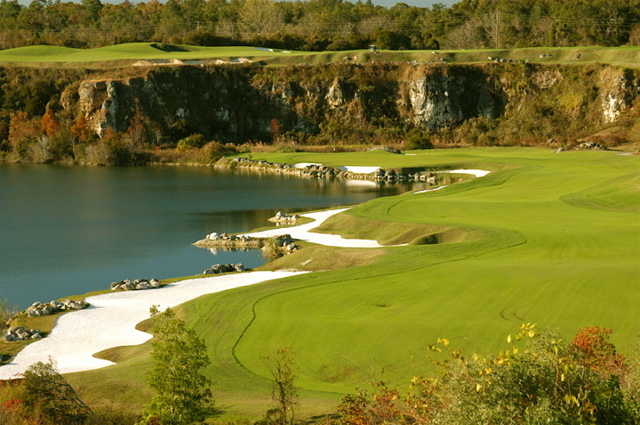 He forged the stunning Quarry Course through steep cliffs and lakes of two old limestone quarries. Today Black Diamond is the Only Private Club in the United States that offers three distinctive Tom Fazio designed Championship courses. If you are interested in living in Black Diamond Ranch let the Cunningham Team at RE/MAX Realty One find the perfect home for you. ​Click below to view Black Diamond Ranch listing by price range. Golf Magazine 2007-2008 Top 100 Courses in the U.S.